"I'm so happy! Thank you for accepting differences between us. Thank you for celebrating diversity!" Barzilai said. 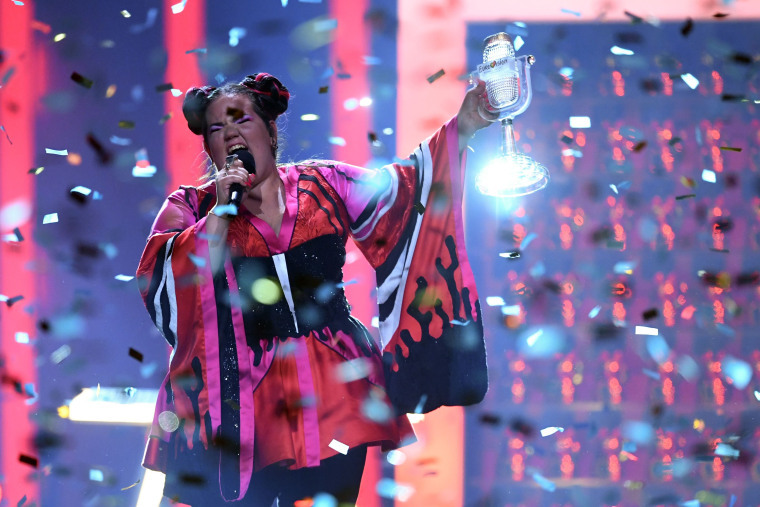 LISBON — Israel's Netta Barzilai won the Eurovision Song Contest in Lisbon on Saturday, bringing Israel its fourth victory in the glitzy pageant, watched by over 200 million people around the world, and the right to host the event next year. "Next time in Jerusalem!" Barzilai, a smiling 25-year-old live looping artist shouted after being named the winner. "I'm so happy! Thank you for accepting differences between us. Thank you for celebrating diversity!" Wearing a Japanese-style kimono and geisha hairdo, she won with a lively dance mix, singing "I’m Not Your Toy" that has a women's empowerment twist, beating Cypriot entry Eleni Foureira with her fiery Latin pop song "Fuego." "I believe that authenticity passes through," said Barzilai, who has previously described the message of her song as being about female power and justice, but with a happy, colourful vibe. Her instantly recognisable song began with Barzilai mimicking chicken clucking sounds to loud cheers from fans. She normally uses a voice looping machine during her live shows, but not in the Eurovision contest where her backing vocalists produced a similar effect. The Saturday night show had been briefly marred by a protester with a backpack who ran onto the stage and grabbed the microphone from British contestant SuRie. She quickly recomposed and continued to sing her song Storm a few moments later. The man was arrested by police, said organizers, lamenting the incident. Cyprus and Israel had been the bookmakers’ favourites going into the 63rd edition of the Eurovision contest, which was hosted in the Portuguese capital. Israel made its debut in the contest in 1971 and had previously won in 1978, 1979 and 1998. Other hopefuls with a social message included French duo Madame Monsieur, clad in black, with their song "Mercy", inspired by the story of a Nigerian refugee who gave birth to a baby girl aboard a boat that rescued her and hundreds of other refugees trying to cross to Europe. The baby's name is Mercy. Lisbon hosted Eurovision for the first time this year after Portugal’s Salvador Sobral won last year’s contest in Ukraine. The event was broadcast from the 20,000-capacity Altice Arena and projected simultaneously on giant screens on the city’s main Commerce Square overlooking the Tagus river, where thousands of music lovers from all over the world partied and cheered for their countries. Tens of thousands of visitors further boosted the record tourist numbers in the city, where pop star Madonna fixed her residence last year. Lodging bookings had jumped by up to 80 percent in Eurovision week and officials expected the event publicity to lure more foreigners.